Kør off-road gennem Tierra del Fuego National Park på dette fulddagse eventyr fra Ushuaia. Besøg Lago Fagnano og Lago Escondido (Hidden Lake) i en 4x4 (Land Rover eller Toyota Prado), der giver dig adgang til uspoleret patagonisk natur og udsigt over det sydlige Andes-område. Nyd en grill ved søen med lokal malbec-vin udarbejdet af dine lokale eventyrguider på denne lille gruppe tur, begrænset til 12 personer. Oplev spændingen ved at køre off road og opdag dele af Tierra del Fuego, der er utilgængelige med bus. Efter hotel afhentning i Ushuaia, rejse omkring en time til Paso Garibaldi, et bjergpas, der skærer over Patagonias sydlige Andes. Kør på tværs af Feugian Cordillera og nyd en fantastisk udsigt over søen Escondido, og stoppe med at kigge for at beundre denne 'skjulte sø'. Tag også udsigten til den uspolerede sø Fagnano. Gå ned i Lago Escondido i dit 4x4 køretøj med et eventyr guide. Off-road blandt træerne i Feugian skoven, hastighed langs mudrede søer spor og sprøjt over lavvandede floder. Værdsætter det spektakulære alpine landskab som bæverdæmmer, lokale savværker og de indfødte bøgræer, før du leder mod Fagnano-søen. Ankomme på Refugio de Canal (Canal Refuge) til en grillmad frokost med førsteklasses beefsteaks, choprian (traditionel argentinsk pølse sandwich), salat, vin og dessert. Anmod om et vegetarisk måltid i forvejen, hvis du ønsker det. Efter et komplet måltid og en fuld dag med eventyr, er du vendt tilbage til dit hotel i Ushuaia. Amazing day with a great guide/driver, Christian! The views were awesome ... It was so much fun and the BBQ was perfect!! Fantastic experience! Had a great time experiencing beautiful lakes, canoeing, land rover adventures, lovely scenery and delicious food! The guides were great fun - spoke English and were very informative. They made sure we had a terrific time and were well-fed! Highly recommended!!!!! My daughter and I took this tour before going on a cruise to Antarctica, and it was fantastic! We were with a family from Colombia and had a really fun time. We were taken to beautiful spots, went canoeing, and had the excitement of driving into a lake after walking along its rocky shore. We ate a late lunch in a setting we will never forget. We're vegetarians and thought we would probably get a cheese sandwich, but our hot meal was creative and delicious. We were really impressed. I want to add that I am 70 years old and did not feel that the ride was too rough. I also do not speak Spanish, but the guide spoke perfect English and described what we were seeing in both Spanish and English. He was both informative and amusing. 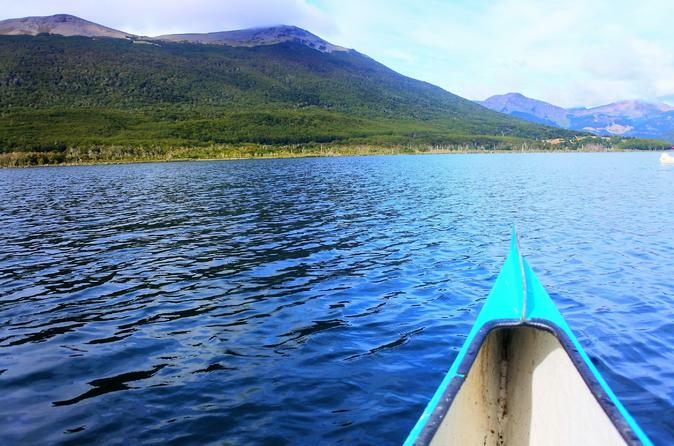 I would recommend this tour to anyone who wanted a fun and exciting off-the-beaten-track day tour of Tierra del Fuego. 4x4 part and the lunch were very good. Unfortunately too much wind to go out canoeing.... limited visibility on the first row behind the driver. Spectacualar drives through water. Unbelivable what a Hilux can do ! It was a very nice day and we saw lots of beautiful scenery. The lunch was wonderful, as advertised. BUT we were not ever in the National Park and that was part of the advertised itinerary. Our group was made up of 3 English speaking people and 5 Spanish speaking people. The guide would talk in Spanish for 10 or more minutes and then give 2 or 3 minutes in English. He answered our questions but the running commentary was obviously not even close to being fairly divided.. Also, we were taken canoeing which was not part of the advertised itinerary...maybe a treat for the younger folks but the older people were not interested. This was a really great trip. Some opportunities for amazing photos- but mostly a very interesting off road adventure. We did the canoeing on Lake Escondido which I must have missed in the description- but was fun! The meal that was provided was the BEST BBQ we had in Argentina. No joke. It was amazing. We had a truly great time the scenery is stunning and our guide, Christian, was wonderful. We got to see two gorgeous lakes, we truly did go off-roading, we kayaked, and enjoyed a delicous meal with lovely people. Would definitely recommend for anyone. Amazing day. Lots of fun and great guides. I am usually a wimp when it comes to these types of trips but thoroughly enjoyed it and would recommend everyone to try it when visiting Ushuaia. Good travelling companions. Trip finished of by a great BBQ anda couple of glasses of Argentinian Malbec.